Some of the 1923 Yerevan pictorials - the first stamps to be printed in Armenia - are in two distinct colours. Others have a pale colour wash background in a colour similar to the dominant colour. This is not an all-over wash - the background colour is patterned so that it does not print on parts of the main design: see the first stamp in the display above to see this clearly. Specialist listings claim that stamps with "background colour omitted" exist. In my experience, it is a real problem to determine in a particular case whether the colour is omitted or not. For example, on the 2000r the background is sometimes in a pale brown colour (think Cafe Latté)and this is easy enough to see - look at the top row of stamps and see how the background colour does not extend into the Star at the top or the "Z Z" on the shield at the bottom. 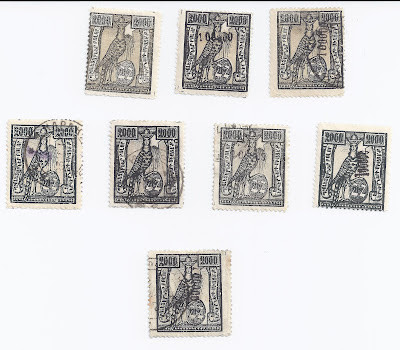 But sometimes the background colour is pale grey and it is sometimes hard to see - look at the stamps in the second row. If you thought the background should always be brown then you might think these stamps are without background. That is not so - look again and on the first three stamps in this second row you can see there is a background. In the bottom row is just one stamp which I think is without background. But I find it so difficult to decide that I do not think I have ever sold a 2000r stamp as an example of "Missing Background".Unfortunately, unsurcharged copies of the stamp are scarce - there were no large stocks of mint remainders of this widely-used stamp. If we had a few large multiples, it would be much easier.